In Lucky 88 the mysterious orient comes to life! 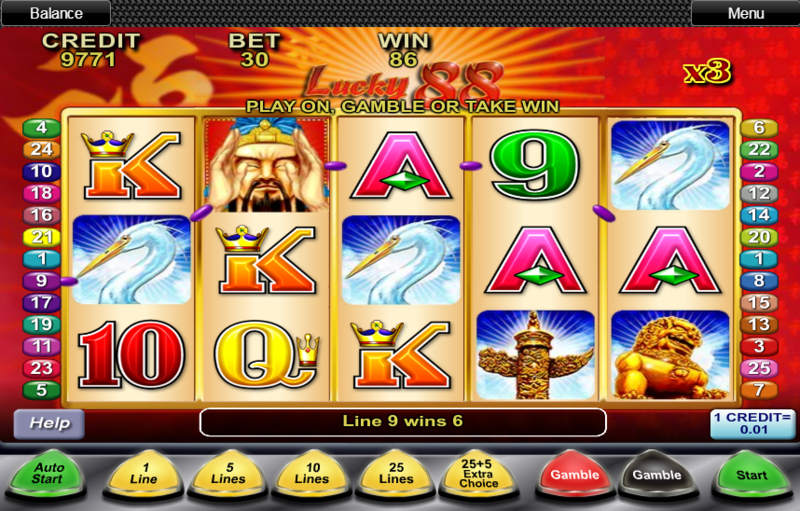 Although not much to look at, this slot has hidden depths including nice bonuses and high-variance. Just remember to add the Extra Choice feature to maximise your RTP. Lucky 88 is, much as the title suggests all about the lucky number 8. In China the number 8 is deemed lucky as when said aloud in Chinese it is a near homonym for the verb "to generate wealth". So the slot is centred around the number 8 and a somewhat old fashioned view of Chinese culture. The theme is based around Chinese artefacts, a stereotypical Chinese man with Fu Man Chu facial hair and the usual Ace to Ten symbols. Overall it has the look of the menu from a not great Chinese restaurant. Lucky 88 is an ugly slot. Gaudy and badly designed, the whole thing is done up in bordello reds and fake gold. The animations are fairly standard and the sounds deeply annoying. Design wise it is a bit of a car wreck. However, gameplay is where Lucky 88 shines. So long as you pay the extra coins for the additional features. 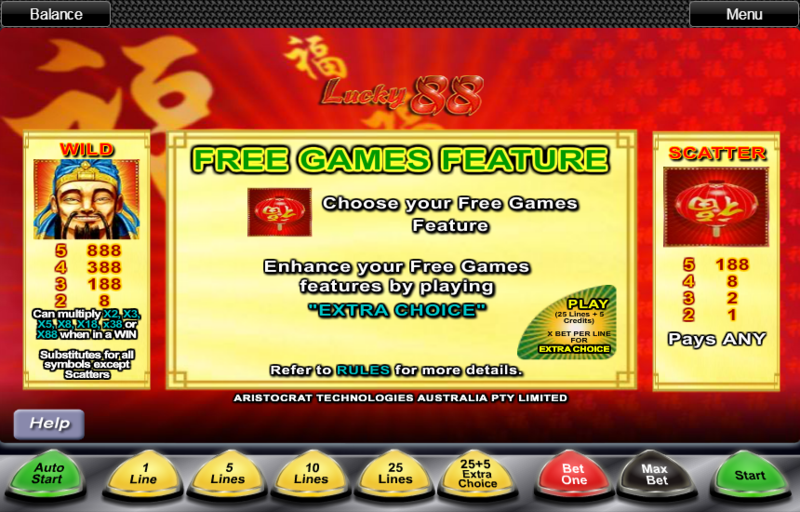 Without the ‘Extra Choice’ option activated, Lucky 88 is a bog standard five reel, 25 payline slot machine with very little of interest. With the ‘Extra Choice’ added it comes to life (and the RTP increases too, see below for details). 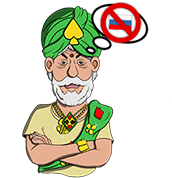 The ‘Extra Choice’ feature adds an extra option for the bonus free spins – and, more importantly, a dice game – should you hit the required three or more Scatter symbols to trigger a bonus. The Wild symbol has a number of extra features too. 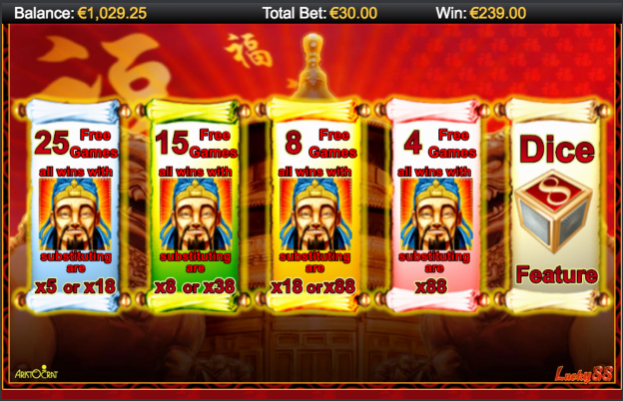 Should you make a winline with just Wild symbols you can win up to 888 coins for five in a row. 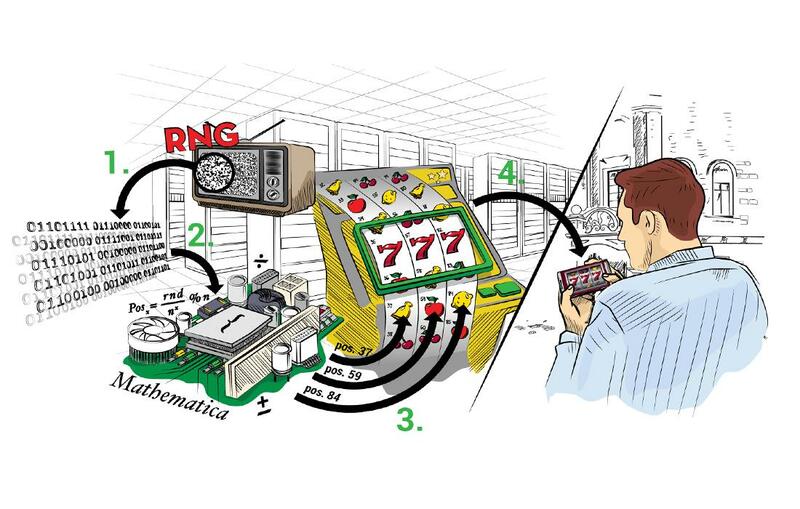 Make a win using the Wild to play as another symbol and your win may be multiplied by anywhere from x2 up to x88. The Scatter symbol (LAMP) wins you a multiple of your bet per spin. From x1 for getting two anywhere on a reel right up to x188 for getting five. The Bonus round, when triggered, gives you a choice of three combinations of bonus spins and multipliers (four if you have the Extra Choice activated). 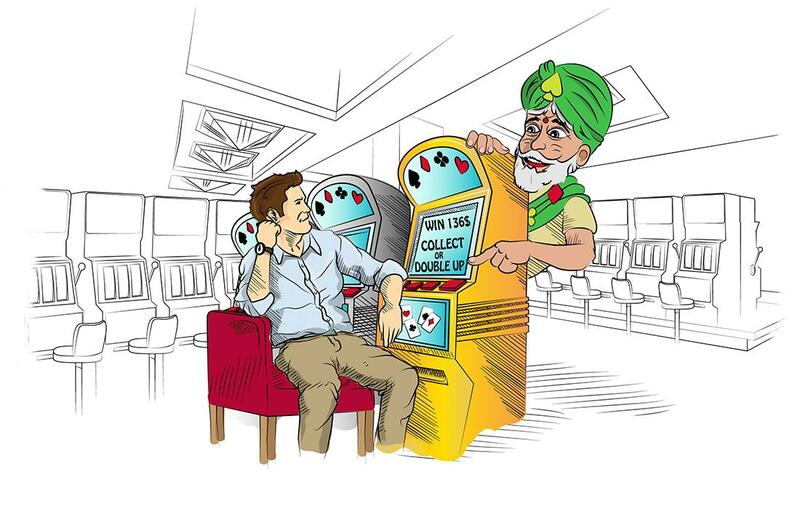 These play much the same as most free spins. If you chose the dice game you are given a ladder of wins based on your bet size. There are nine dice in a 3 x 3 grid (see image) and the outer eight are rolled over and over with any eights that come up being frozen. The round ends when no eights are rolled and then you are paid based on the total number of eights. Then the central dice is rolled. This dice contains more free rounds at the dice game and multipliers. The RTP without extra choice is a brutally low 89.97%, but if you want to pay a little extra to add that feature you do increase that to a slightly more bearable 95.60%. It is still not a great return, but is much more in line with other slots of its type. 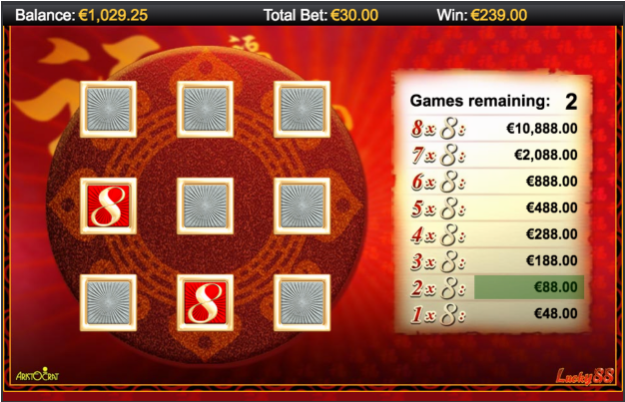 On the definite upside, Lucky 88 is a high variance game. The major downside is that despite its adjustable number of winlines to play with the pretty much necessary Extra Choice feature you must also play all 40 winlines. This makes it less suitable for those with small bankrolls. 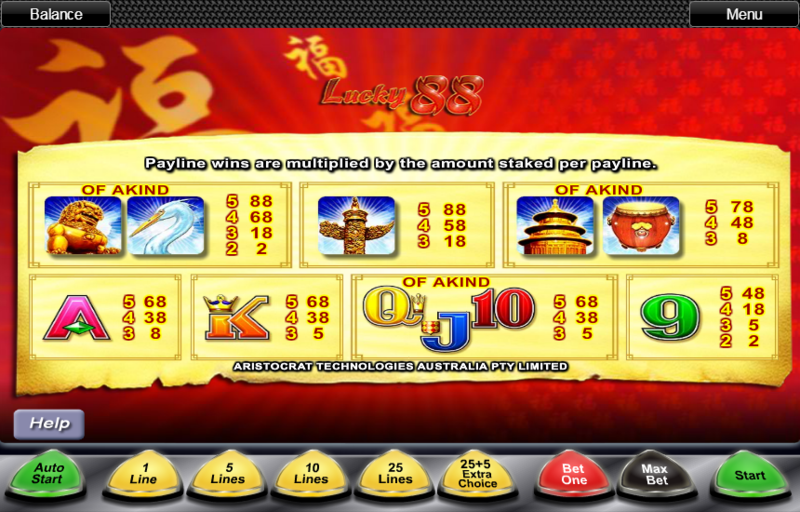 Lucky 88, though quite unpleasant to look at, is a fun slot that we can recommend as long as you are willing to pay the additional coins to get the Extra Choice feature. The dice bonus is fun and the high variance and average RTP are definite draws for us.